At this price, the TL-6 could not only be an ideal onstage electro for loud scenarios but also a source of left-field, treated 'acoustic' tones. Low feedback. Very good value for money. Plays like a rock guitar. Lack of low end. A little hiss. 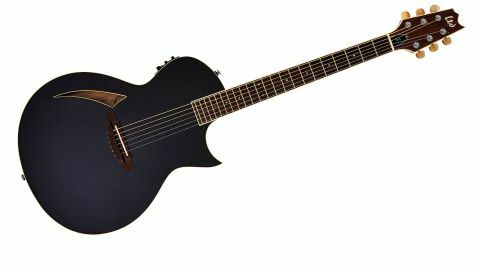 ESP's affordable LTD range is known for its rock and metal-friendly guitars, less so acoustics. Although the brand unveiled a new line of traditional acoustic boxes at this year's NAMM gear-fest, at the end of 2014, it took the wraps off a more innovative three-guitar TL (as in thinline) range: a steel-string, nylon-string and 12-string. We say 'innovative', but the thinline electro-acoustic is hardly new. However, in today's over- stocked market, the genre is pretty rare and often high-end in price. So, what's the attraction? "This isn't a standard feedback-friendly acoustic; it's a stage guitar that's meant to be amplified"
As any gigging acoustic player will know, getting a good amp'd acoustic sound at high volume levels - for example, when playing with a full band - can be problematic, not least with feedback caused by your acoustic's full-depth hollowbody. Throw in a loud bassist and over-noisy onstage monitors, and in some scenarios, feedback will win the day: not good. The thinline concept reduces the amount of air within the body and, typically, adds some solid wood to join top to back: both features should reduce onstage feedback. That's the theory. The TL-6 looks like a slightly enlarged ESP Eclipse: the back is routed out, leaving sides, a centre block under the acoustic-like bridge, and a pocket for the glued-in neck. It's capped with a maple top, with sizeable 'slash' soundhole and bound edges. With a rock-like 'thin U' neck profile and width, the TL-6 feels more like a rock semi than a Martin D-28, but with a 350mm (13.8-inch) fingerboard radius, pretty big but nicely fettled frets and a low-ish action, any electric player is going to feel at home. Acoustically, not least because of the compromised soundbox, there's little projection: it's okay for practising and in-front-of-the-telly noodling, but little else. But that's the point: this isn't a standard feedback-friendly acoustic; it's a stage guitar that's meant to be amplified. The onboard B-Band Electret Film under-saddle transducer, combined with the B-BandT-7Preamp-withvolume, three-band EQ, onboard tuner and phase switch - is fit for purpose. There's a slight lack of wallop to the low E and a little too much hiss for ultra-quiet studio recording, but the EQ is sensible, the phase switch essential to tame feedback, and the overall sound is more than credible, especially mixed in with a larger band. And, by design, the TL-6 has a much higher feedback threshold than any full-depth electro-acoustic we had to hand. This is an ideal guitar to run through your pedalboard and create acoustic-textured 'electric' sounds; its boundaries are your imagination. We can't help thinking an additional magnetic pickup version would blur the lines even more.